We kicked off the week with tons of goodbyes and TONS of tears! Saying goobye to friends and family was harder than I thought it would be and the surge of emotions accumulated into a very tearful goodbye. One of my nieces stayed home from school, with my mom, so that could be there to see us off; crying with her and watching her tears as we drove away, was almost enough to make me turn around. But I’ve just told her she has to convince her mom to become a travel nurse so that they can come join us! Our first stop was in Georgia, where we got to spend time with our youngest niece. So, even though the initial goodbyes brought tears, the full-time RV life also granted us the gift of seeing even more people we love on the way to our next destination. I think I am going to really like that perk!! It's All So Mind Blowing! We spent two nights in Georgia and headed north to North Carolina. We were driving down backroads a lot of the way and it fully hit me… “Oh my heavens! We DID it! We are on the road!” I couldn’t stop laughing and saying to Babe, “This is our life now! This is our life?! We are actually living on the road!” It is still blowing my mind and I keep thinking, “ok, when do we have to turn around?” Not sure when it will fully sink in; and honestly, I’m not sure if I want it to! We stayed at a beautiful Thousand Trails park, for two nights, near Winston-Sale, NC. Forest Lake RV Resort and Campground quickly became one of our favorite Thousand Trails resorts. It has had two historic sites on it (an tobacco house and an old cemetery), a hot tub that was practically deserted, and super friendly staff and fellow campers. It was the perfect place to work on getting Delilah a little more organized and feeling like home. We had planned to do some hiking and exploring, but used most of the time to do a Walmart run for supplies and pre-prep for being snow-weather bound! Now, it’s Friday morning and we are in route to West Virginia, where we will be working at a ski resort for the next three months. Yes, we know! Starting the RV life out braving the snow?! I guess we will find out how crazy that is, but these Florida natives are excited for their first true winter! Anyone love skiing or playing in the snow?! Come visit us at Snowshoe Mountain!! Hoping your Friday becomes Friday at 5 quicker than a wink! Congratulation on making dreams come true exploring together! I’m sure goodbyes were terribly hard but you will be back! You are mobile after all! 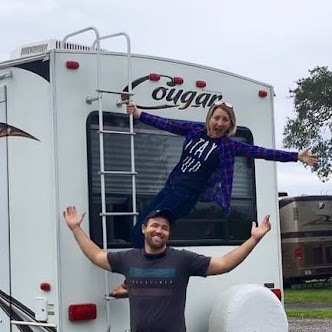 It's so cool that y'all are going for it and following your RV dreams! 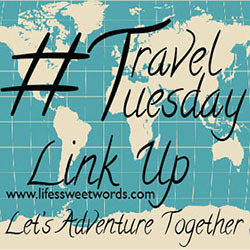 I fantasize about going to live in an RV or converted van all the time haha, I can't wait to follow your journey! That's wonderful for you to have this opportunity. Leaving must have been hard but you'll make memories you couldn't do otherwise!